Beads with texture or interesting designs on the surface with plenty of ideas to keep you busy for a while. Articles: Sensational Surfaces, by Diane Woodall; Journeys, by Darryle Jadaa; Different Methods for Dipping Mandrels, by Diane Woodall | Features: Inspirational Collages, by many artists; Featured Artist - Anne-Lise Meier, by Leah Nelson; Grubby Mitts Report, by Diane Woodall | Tutorials: Dot by Dot, by Anne-Lise Meier; Rustic Opal Off-Mandrel Pierced Shield Pendant, by Lori Lochner; Seafoam Shards Focal Bead, by Diane Woodall; Bumpy Hedgehog, By Heather Seller. We use metal in our glass beads to bring a whole new universe to our standard bead. Silvered ivory stringers or foil encased on the bead delivers a WOW factor like nothing else can. Palladium, gold, brass and silver produces amazing (usually) gorgeous results. Applied as mesh, foil, leaf, wire, or frit, metals can add a completely new dimension. Our Featured Artist is Leah Nietz, by Leah Nelson | Articles include: Metal Magic!, by Diane Woodall; How to Sell Your Work on Facebook, by Darryle Jadaa; How is Gold Leaf Made?, by Diane Woodall; Using Gold Leaf, by Karen Leonardo; and Making Beads Using Brass Frit, by Cynthia Tilker | Inspirational Collages, by various artists | Tutorials: Energy Vessel, by Leah Nietz; Show-Stopping Starburst Heart, by Trudi Doherty; Silver Foil Recipes, by Chelsea Pavloff and Angie Roberts; and Zoom Zoom!, by Heather Seller. 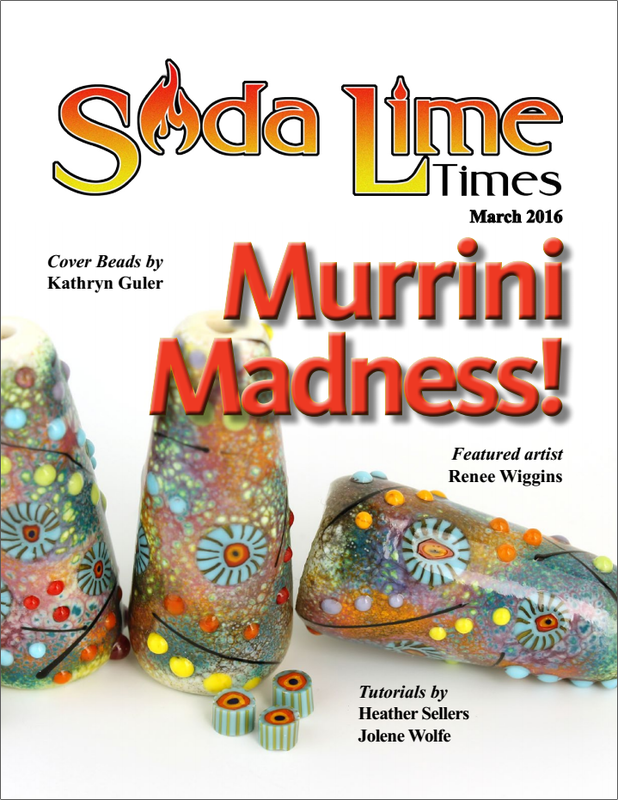 Made or bought, Murrini is magic for beadmakers. 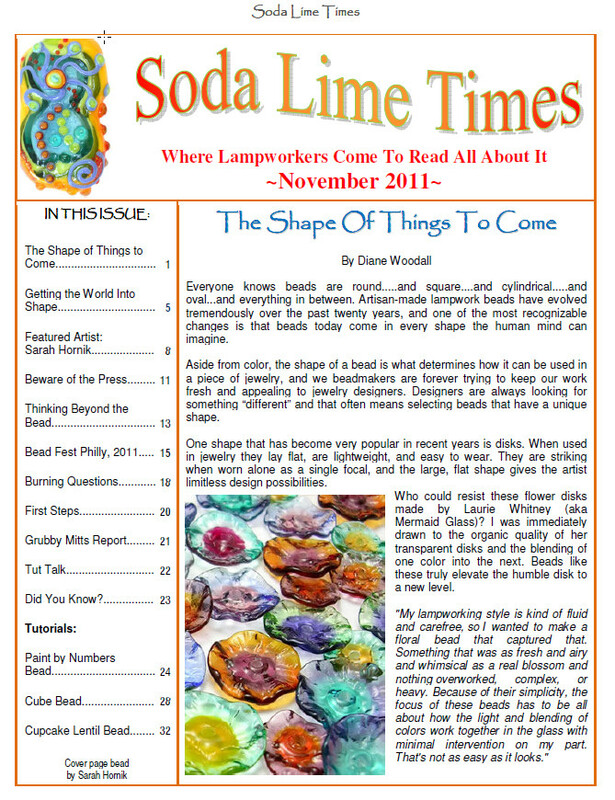 In this issue: Articles: Murrini Madness, by Diane Woodall; Tips, Tricks and Techniques, by Darryle Jadaa; The Journey of a Modern Day Apprentice, by Ri Crye | Features: Featured Artist, Renee Wiggins, by Leah Nelson; Inspirational Collages, by many artists; Grubby Mitts Report, by Diane Woodall | Tutorials: How to Make Starburst Murrini, by Renee Wiggins; Cosmic Collision Star Murrini Bead, by Kathryn Guler; Sweetheart Murrini, by Jolene Wolfe; Snack Time with Wally Beads of Courage tutorial, by Heather Sellers. 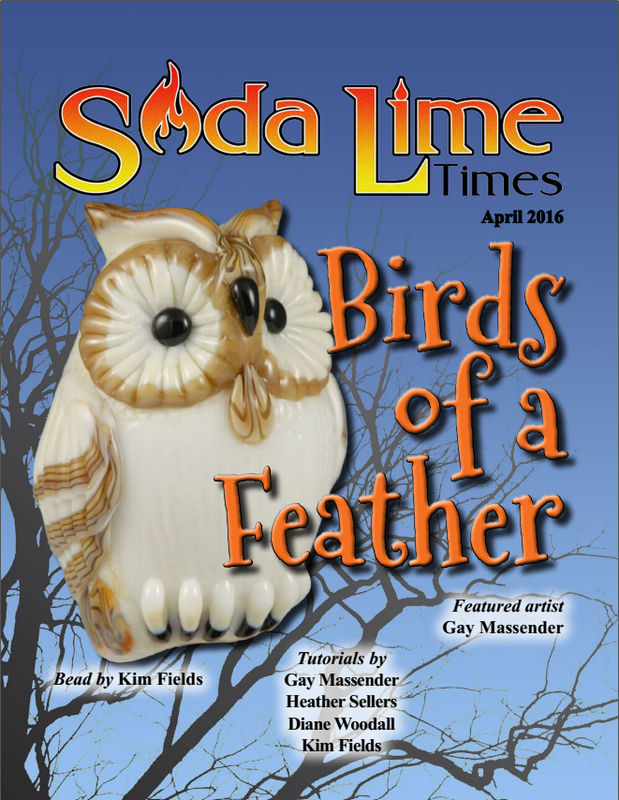 This issue is for the birds, with bird beads in a myriad of shapes, sizes and forms. “Exploring and Playing to Create,” by Leah Nelson, highlights Gay Massender our featured artists of the month. Among other things, her wire bird’s nest that holds an adorable bird on a wire, sitting on top of a fine lady’s head makes a humorous broach. The “Inspiration Gallery” is full of birds from chickens to owls to a bird sitting on a cat, and many more. | Articles: “Sara Sally’s Grand Birds,” by Leah Nelson, and “Our Significant Others and How They Support Us,” by Darryl Jadaa make for interesting reading. | Feature: The Grubby Mitts report, by Diane Woodall, for places to find bird bead related stuff. | Tutorials: Bird’s Nest Broach, by Gay Massender; The Night Watchman (owl tutorial), by Kim Fields; Nesting Chicken, by Diane Woodall; and, the Wakadoo, by Heather Sellers (suitable perhaps for Beads of Courage). Summer is a great excuse to pull out your brightest glass colors and make beads that wow! The beach, blooming flowers, big green trees, picnics, magic all around; all say “summer.” This month’s articles are: Sensational Summer, by Diane Woodall; Featured Artist, Angelika Kaufmann, by Leah Nelson; Round Robin - a Beadmaker’s Journey to Inspiration, by Angela Meier; Finding Organization, by Paquerette Charlas; Choosing the Right Eye Protection, by Darryle Jadaa | Special Features include: Inspiration Gallery, multiple artists, by Diane Woodall; Grubby Mitts Report, by Diane Woodall | Tutorials include: Ink Watercolor - Painting on Glass, by Angelika Kaufmann; Saltwater Therapy - Hollow Seashell, by Terry Hale; Flower Power Jawbreakers, by Diane Woodall; Summer Fling Beads of Courage Tutorial, by Heather Sellers. Glass fish are beautiful. 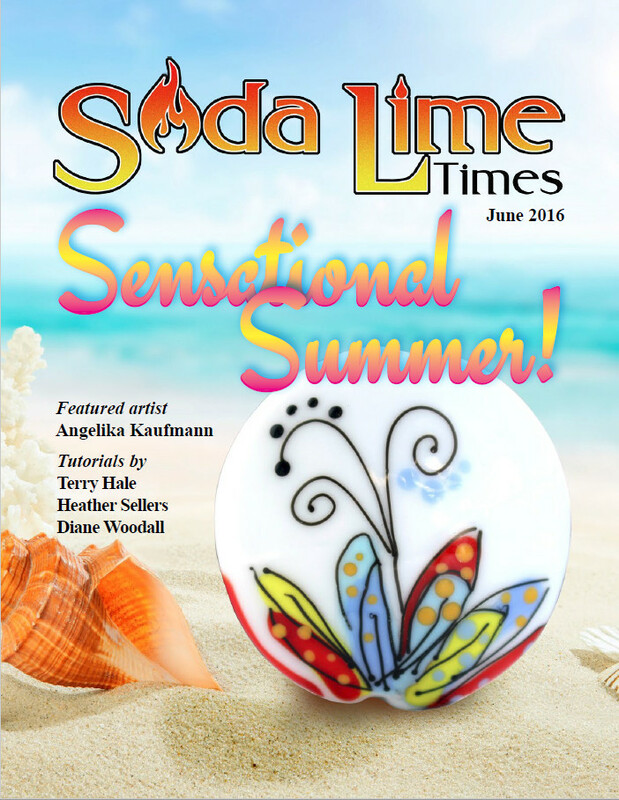 For proof just look at the July 2016 SLT issue. It’s all about FISH. 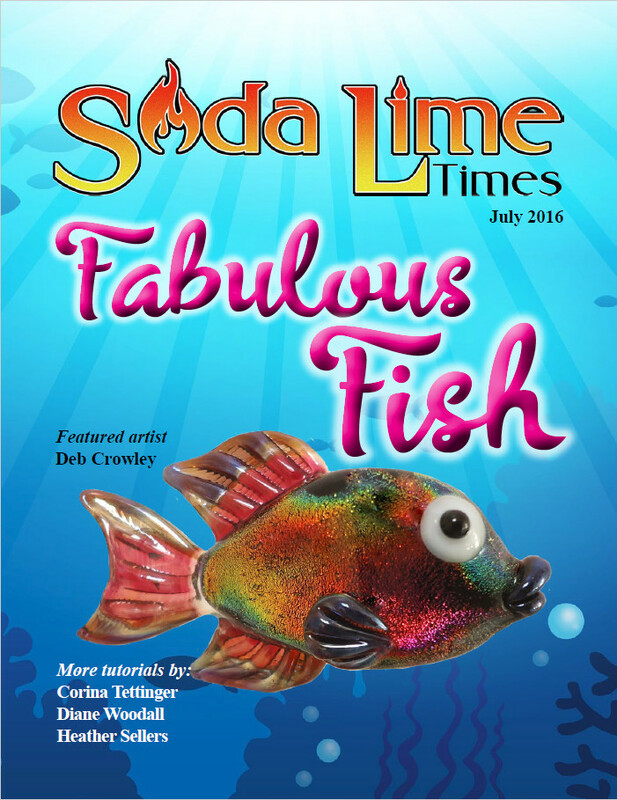 Deb Crowley, well known for her fish, shares here technique for using dichroic to make her fish really jump (sorry). Articles: Fabulous Fish, by Diane Woodall; Featured Artist - Deb Crowley, by Leah Nelson; Fish Recipes, Claudia Trimbur-Pagel’s book, by Darryle Jadaa; Shoal - a Linda Newnham Creation, by Diane Woodall | Inspiration Gallery (7 pages of fish from many artists) | Grubby Mitts Report, by Diane Woodall | Tutorials: Wearable Dichroic Fish Bead, by Deb Crowley; Gone Fishing - Inspiration from the Pond, by Corina Tettinger; Puffer Fish Ceiling Fan Pull, by Diane Woodall; Goldie - Goldfish Bead (Beads of Courage), by Heather Sellers. 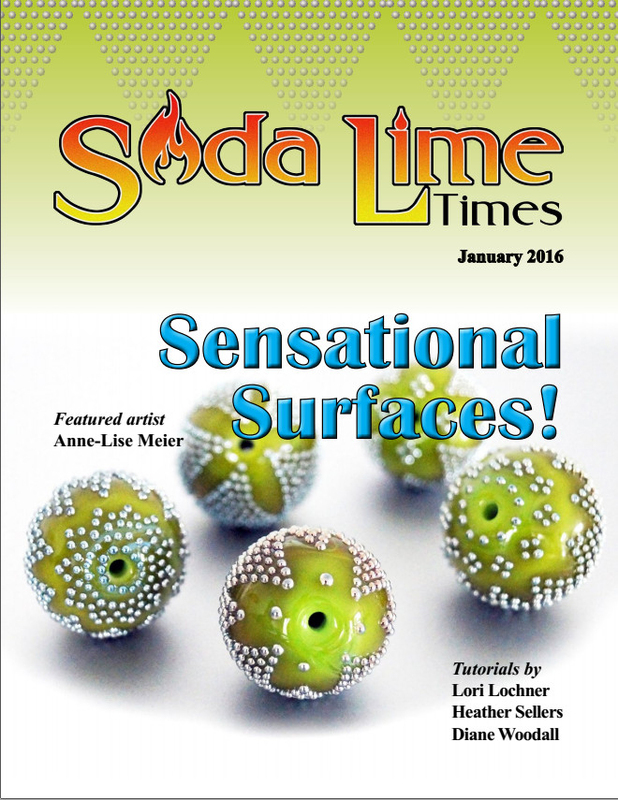 Jewelry made from lampwork beads is the focus of this month’s Soda Lime Times. Featured artist this month is Irina Sergeeva who makes stunning jewelry mixing lampwork with metal. Articles: The Melting Point Studio, by Darryle Jadaa; and, Stardust Necklace, a collection by Ronnie Lambrou and Jeri Warhaftig, by Diane Woodall | Two inspirational galleries this month, one at the front of the magazine and one in the middle (too many good contributions by our readers to just have one) | Tutorials: Delicate Like the Morning, by Irina Sergeeva; Thinking Outside the Mold Cone /Drop /Dangle /Button, by Patricia Larsen; Three-Hole Flower Component, by Stephanie Sersich; Striation Bead Wavy Necklace, by Hilary Tillin; How to Make a Ball-End Headpin, by Kimberly Roberts; and Glam Pink (Beads of Courage tutorial), by Heather Sellers. 66 Pages. Glass is magical. It may be formed into just about anything. This issue goes beyond beads to something new. 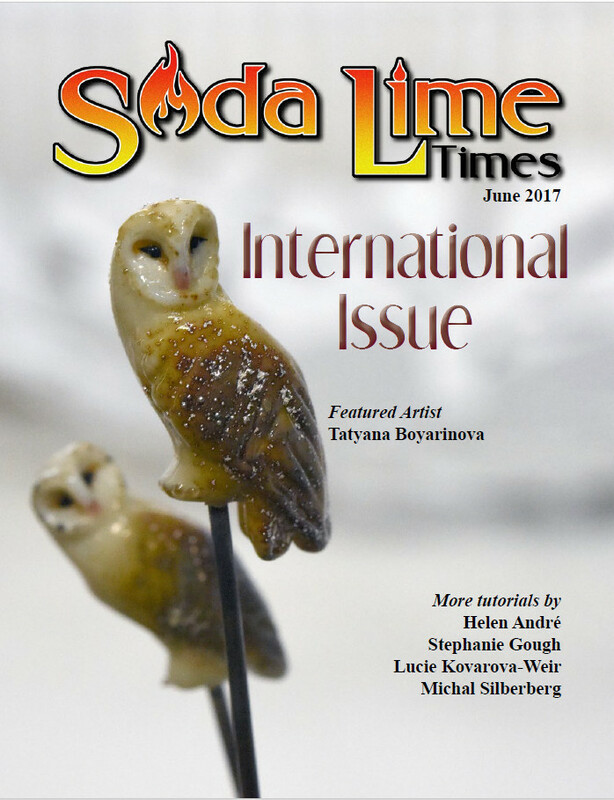 Featured Artist: Amanda Muddimer, by Leah Nelson, from the UK, shows her talent at amazing cabochons | Articles: Leopold and Rudolf Blaschka, A Legacy in Glass, their work is truly unbelievable and must be seen, by Darryle Jadaa; Waste Not, Want Not, Introducing the “Bead Blob,” By Leza Harary | Features: Grubby Mitts Report, by Diane Woodall | Tutorials: Simple Fun Cabochons Ringtoppers / Poppers, by Amanda Muddimer; Silvered Ivory Scroll Marble, by Jason Powers; Glass Cone Pincushion, by Amy Ouellette; Embellished Copper Frames, by Kimberly Sturrup-Roberts; Dive Into Glass, Forced Encasement Paperweight Tutorial, by Heather Sellers; Sparkly Boro Icicle, with an Easy Pre-Made Loop, by Diane Woodall. All about beads that are NOT round, the donut bead takes a back seat in this issue. Featured Artist: Patricia Larsen, The Shape of Things to Come, by Diane Woodall, is the rule that proves the exception with almost every shape she can imagine, but round. | Articles: Thanks for the Memories, Tales of Favorite Teachers and Studios, by Darryle Jadaa. | Features: The Grubby Mitts Report, by Diane Woodall. |Tutorials: All Stacked Up, by Patricia Larsen; The Swirly Shells, by Anneli Gustavsson; Autumn Floral Fantasy, Using Non-Round Cabochon Plates, by Judit Szöke; Fly Away with Me, Heart Toggle, by Kimberly Sturrup-Roberts; and, Speedy Rainbow Hearts, by Heather Sellers. Inspired by tall mountains, valleys full of blooming flowers, the stark beauty of the desert, or a calm serene ocean at night, landscape beads become their own little world in your hands. Featured Artist, Pati Walton, is one of the best known landscape bead artists in the world. 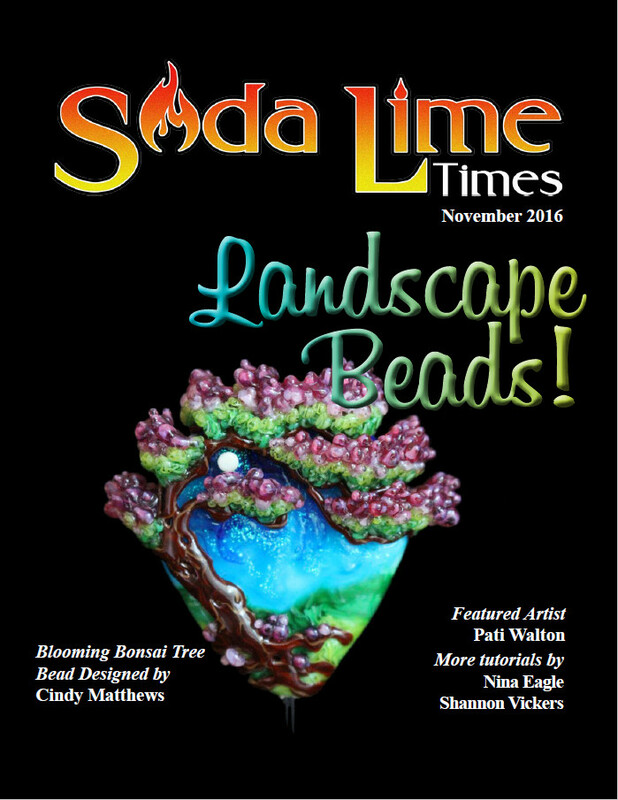 Articles: Landscape Beads - From Panorama to a Finished Bead, by Diane Woodall, Pricing Your Work - Strategies for Selling Your Work in a Competitive Market, by Darryle Jadas | Special Feature Landscape Tutorials for past issues of the Soda Lime Times | Tutorials: Layered Landscape, by Pati Walton; Blooming Bonsai Tree, by Cindy Matthews; Night Beach, by Nina Eagle, and Peek-a-Boo Alien, by Shannon Vickers. Nothing is more beautiful than an encased lampwork bead. This issue is filled with that beauty. Featured Artist: Michelle Waldren, by Diane Woodall; Encasing - Asking the Experts, by Darryle Jadaa | Encasing tutorials from past issues | Grubby Mitts Report, by Diane Woodall | Tutorials: Ribbon Twistie Focal Bead, by Michelle Waldren; Glowing Bead, by Régis Teixere; Multi-color Ethereal Bead, by Jennie Lamb; Striated Encased Purple Heart, by Diane Woodall; Wig-Wag Baubles, by Shannon Vickers. A winter color, white, is an essential color for bead makers. It is a background color for sure, but this issue explores many of the other uses of white. 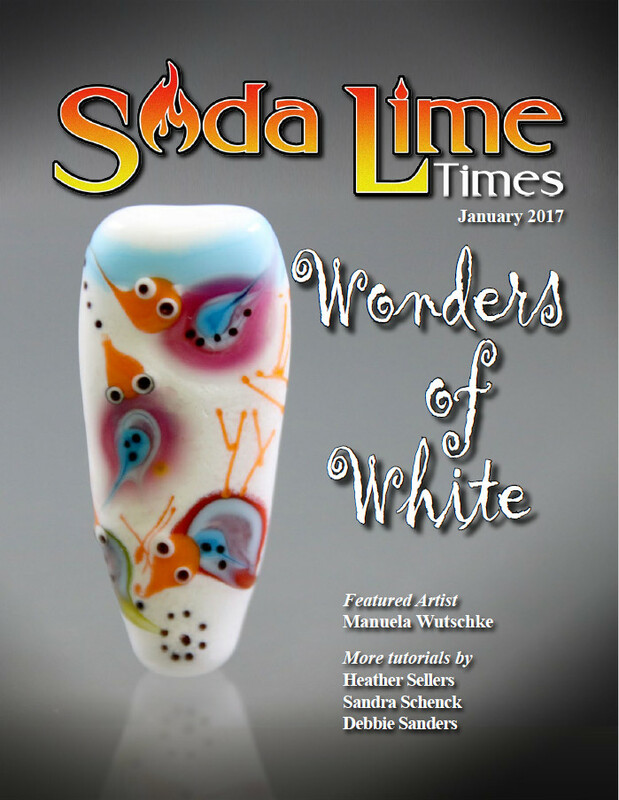 Featured Artist: Manuela Wutschke, Art + Humor = True Happiness, by Diane Woodall | Articles: The Ergonomics of lampworking, by Darryle Jadaa; My First Craft Show - Lessons Learned, by Donna Felkner | Features: For Your Inspiration, collages; The Grubby Mitts Report, by Diane Woodall; Previously in Soda Lime Times | Tutorials: Winter Brings out the Magic, by Manuela Wutschke; Snow White Discs, by Debbie Sanders; Frill Flower Murrini, by Sandra Schenck; and Great Horn-Rimmed Owl, by Heather Sellers. Working small in lampwork can be just as challenging as working big; maybe sometimes even more so. But small doesn’t mean dull or boring; just look at the gallery to see what I mean. 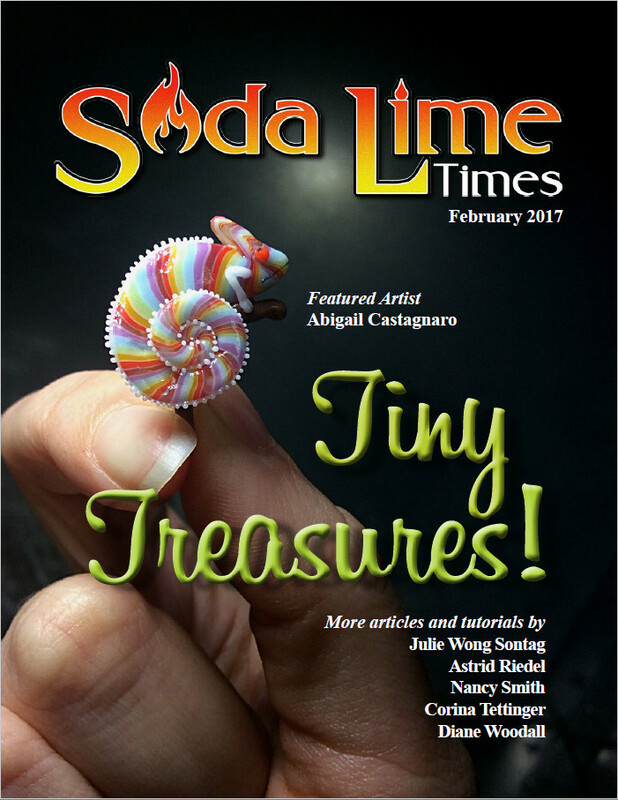 Featured Artist: Abigail Castagnaro, Boro on a Tiny Scale (Just look at what she puts in a tiny bottle), by Diane Woodall | Article: (Amazing) Creativity Beyond the Glass, by Astrid Riedel | Tutorial: Birth of a Chameleon, by Abigail Castagnaro; Itty-Bitty Bunny & Yummy Red Radish, by Nancy Smith; Cabochon Earrings, Tiny & Fabulous, by Corina Tettinger; Charming Seashells, Tiny Auger Headpins, by Diane Woodall; Birdies, Two to a Mandrel, by Diane Woodall. Flowers truly do make people happy, which explains why floral beads never go out of style. Six pages of flower beads in our Inspiration section showcase dozens of beautiful flower beads from all over the world. 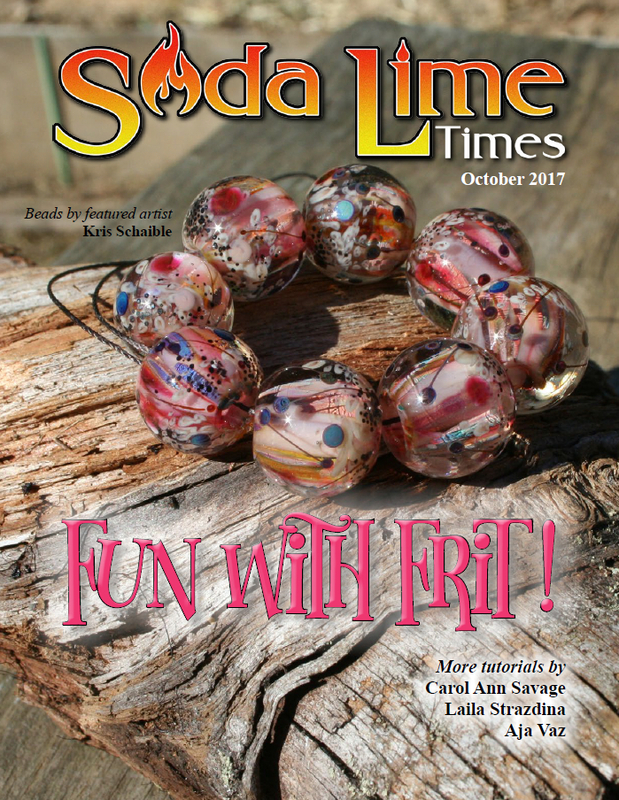 Featured Artist: Kristen Frantzen Orr, Artist at Heart, by Diane Woodall | Articles: Saying Farewell to Diana East (1954-2017), by Sally Carver; How to Make Frit (104COE), this is basically a tutorial, by Desi Cachia | Features: Tut Talk, Review of “My Dream Bead” by Jacqueline Parkes, by Darryle Jadaa; Spotlight, Flower Murrini, by Diane Woodall | Tutorials: Winter Garden Bead, How to Make a Flower Bead Using Striped Flower Cane, by Kristen Frantzen Orr; Blooming in Glass, Off-Mandrel Floral Pendant, by Elena Hernburg; Romantic Bouquets, Multi-Layer Plunged Floral Bead, by Kathy Greer; Waiting for Spring, a Glass and Mixed Media Bangle, by Kimberly Sturrup Roberts. Color and lots of it is the focus of this issue. Just look at the Inspirational Collage and you will see what I mean. 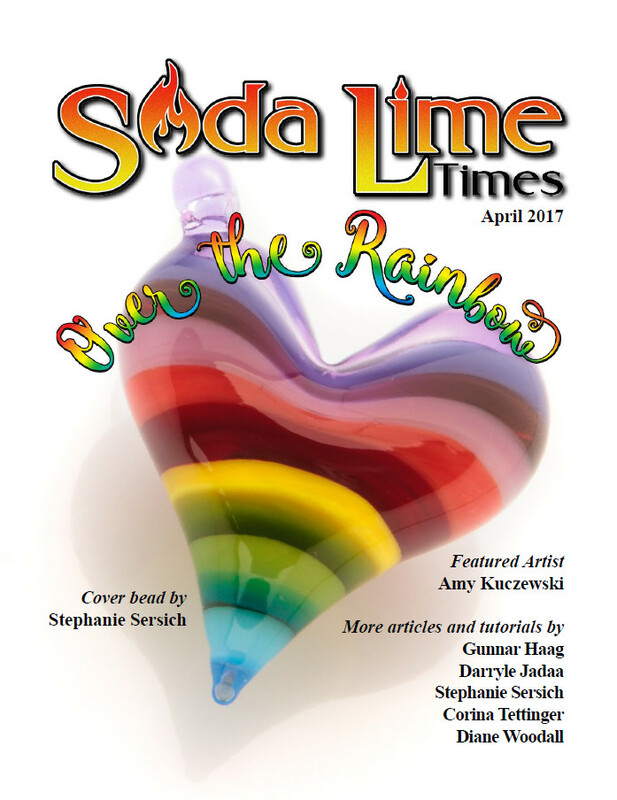 In this issue: the Featured Artist, Amy Kuczewski, amazing Bollywood Rainbows, by Diane Woodall | Articles: Chevron Beads, Part 1, The Classical Form, by Gunnar Haag; How to Use a Color Wheel, by Darryle Jadaa | Features: Spotlight, Dip-n-Go Sludge Ultra bead release, by Diane Woodall | Tutorials: Featured Artist’s tutorial, Maximum Rainbow, by Amy Kuczewski; Stripy Rainbow Heart, by Stephanie Sersich; How to Make a Rainbow Bridge Bracelet, by Corina Tettinger; Hawaiian Shirt Focal Bead, by Diane Woodall. 6th Year Anniversary Issue - Inspiration with Beads from Around the World | Featured Artist: Tatyana Boyarinova, Never Give Up and Never Say Never, terrific Russian Lampwork, by Diane Woodall | Articles: GSS Flameworking Studio, Ottawa, Canada, by Darryle Jadaa; Chevron Beads, Part 2, New Shapes and Techniques, by Gunnar Haag | Features: Spotlight on Murrini by Kaz Baildon, by Diane Woodall | Tutorials: Wise Little Owl by Tatyana Boyarinova; Wild Roses, by Helen André; Coral Shores, by Stephanie Gough; Calla Lily Bead, by Lucie Kovarova-Weir; Happy Owl Bead, by Michal Silberberg. In the issue Featured Artist is Tammy Mercier, by Diane Woodall | Articles: The importance of Research in Bas-Relief Animal Bead, by Joy Munshower and Darryle Jadda; An Introduction to Teaching Lampwork From your Home Studio, Part 2, by Diane Woodall | Features: Inspiration Gallery, by many contributors; Spotlight - Let’s Draw Animals, by Diane Woodall | Tutorials: Eye of the Wild, by Tammy Mercier; A Bird in the Hand, by Elise Strauss; Curly Caterpillar, by Margaret Zinser Hunt; Ollie the Orca, Beads of Courage Tutorial, by Shannon Vickers. Presses for beadmakers have come into their own. 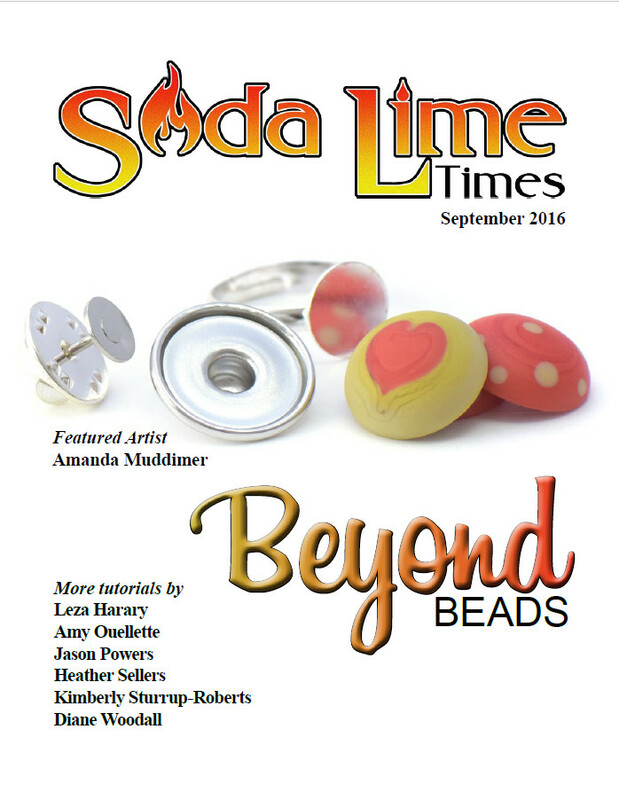 This issue explores the fun and utility of bead presses. | Inspirational Collage |Featured Artist: Ray Skene, Toolmaker, Artist, Visionary, by Diane Woodall | Articles: Beyond Basic Tools, by Desi Cachia; Getting Down to Business, the Price of Success, by Catherine Winter | Features: Spotlight, Let’s Start Pressing!, by Diane Woodall | Tutorials: How to Use a Prism Heart Press, by Ray Skene; Rainbow Pillows, by Pearly Karpel; He Loves Me, He Loves Me Not, Pull Knob, by Nancy Sinclair; Angel Wings, by Corina Tettinger; Quick and Easy Pressed Leaf Headpins, by Karen Leonardo. 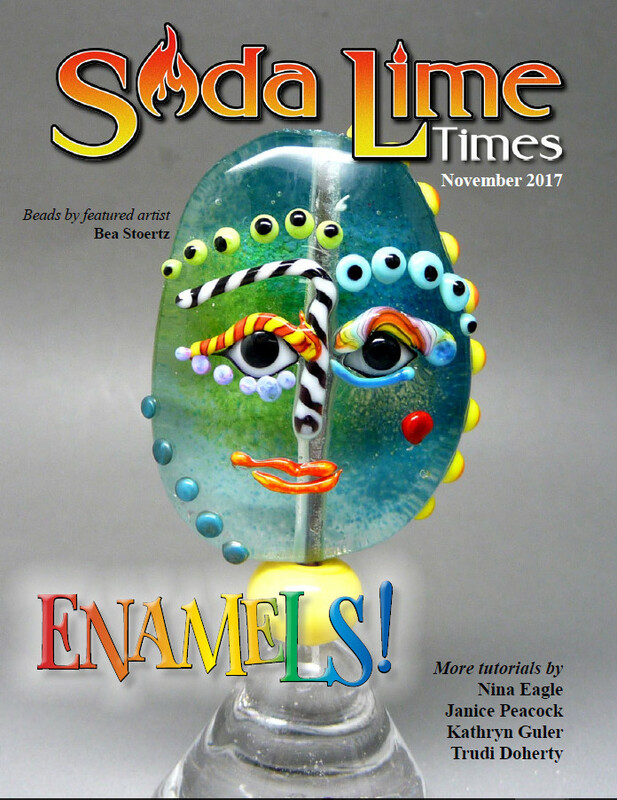 Our November 2017 issue is all about enamels and how to use them, with our featured artist Featured Artist - Bea Stoertz. 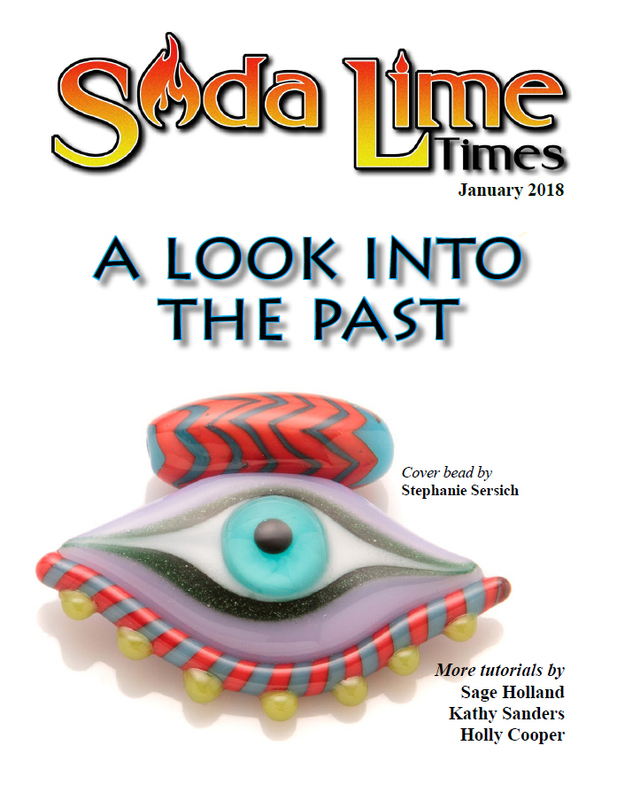 Articles include Thompson Enamel A Rich History of Color by Darryle Jadaa; Caravan Studios - On the Move by Diane Woodall; Getting Down to Business - Shop Policies by Catherine Winter; and our monthly business column Spotlight - A Look Back at Enamels by Diane Woodall. Tutorials include Enameled Faces by Bea Stoertz; Enamel and Murrini Cabochon by Kathryn Guler; Enamel Iridescence Reduction by Nina Eagle; Freeze and Fuse Pâte De Verre Beads by Janice Peacock; Snow Globe A Beads of Courage Tutorial by Trudi Doherty. Our January 2018 issue explores the beauty and history of traditional and ancient bead designs with featured artists Tom and Sage Holland. 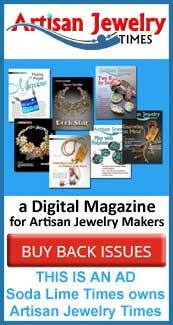 Articles include A History of Mimicking Precious Materials in Glass by Floor Kaspers; Living History - Recreating a History of Glass Beads by Suzanne Tate; Getting Down to Business - Evolve or Die by Catherine Winter; and our monthly Spotlight by Darryle Jadaa on the book Dots, Dots, Dots by Deanna Griffin Dove. 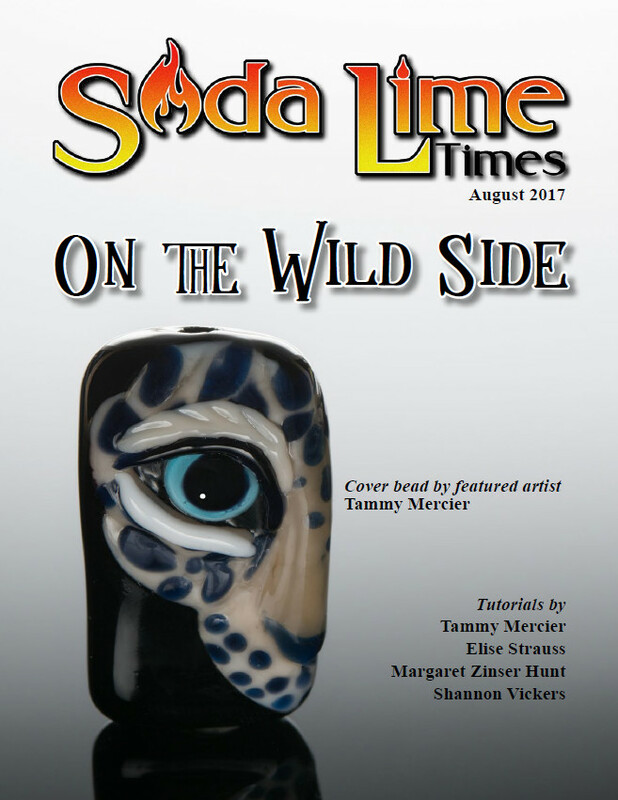 Tutorials include an African Shield Bead by Sage Holland; Kuba - A Bead Inspired by African Tribal Patterns by Holly Cooper; Traditional and Timeless Telemark Techniques by Kat Sanders; and an Eye Pendant by Stephanie Sersich. Our February 2018 issue features one of our favorite themes - hearts! Our featured artist is Sabrina Koebel. Articles include I Give You My Heart - Eww! by Darryle Jadaa; Getting Down to Business - You Are in the Driver’s Seat by Catherine Winter; and our monthly Spotlight - Lumiere Lusters by Darryle Jadaa. 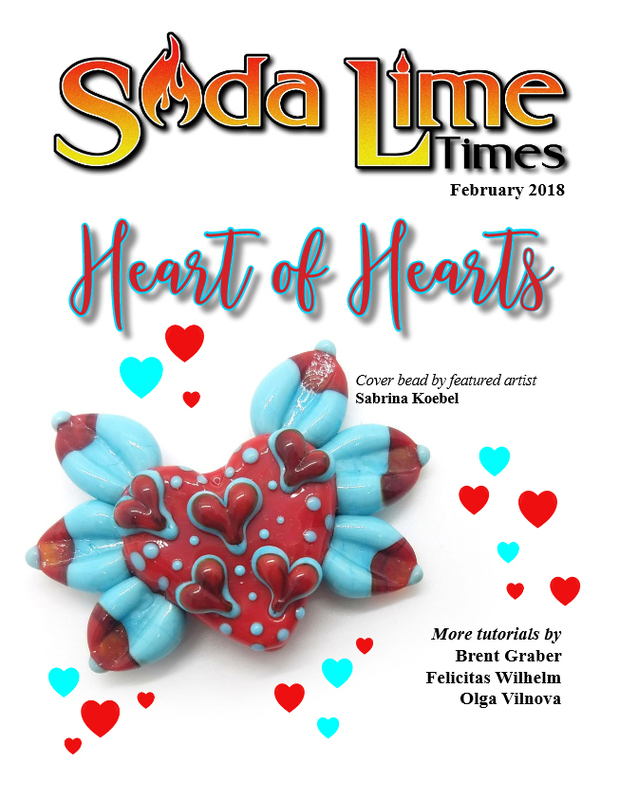 Tutorials include Beachy Heart by Sabrina Koebel; Hearty Heart by Sabrina Koebel; Sea Heart by Olga Vilnova; To the Heart’s Content by Felicitas Wilhelm; and Mr. Smiley Hearts by Brent Graber. Our March 2018 issue is all about murrini – how to make them and use them. Our featured artist is Elena Hernburg. 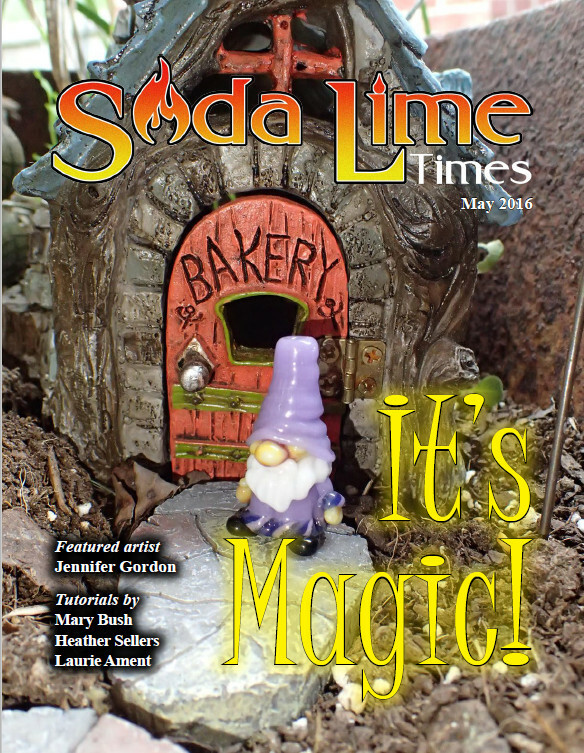 Articles include Procrastination by Andy Cooperman, Tips, Techniques, and Questions by Darryle Jadaa, Getting Down to Business - How to Rock a Custom Project by Catherine Winter, and our monthly Spotlight – Magical Murrini of Jackie Gundlefinger by Darryle Jadaa. 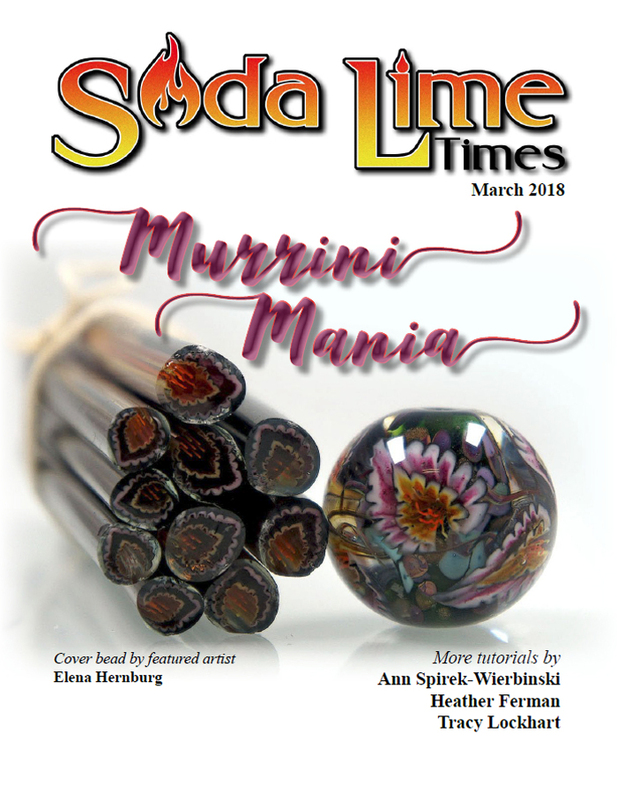 Tutorials include a Murrini Petal Bead by Elena Hernburg (on our cover), Murrini Techniques for Small Torches (a clownfish) by Heather Ferman, Smiley Face Murrini by Ann Spirek-Wierbinski, and Marvelous Melts (murrini and enamel on copper) by Tracy Lockhart. 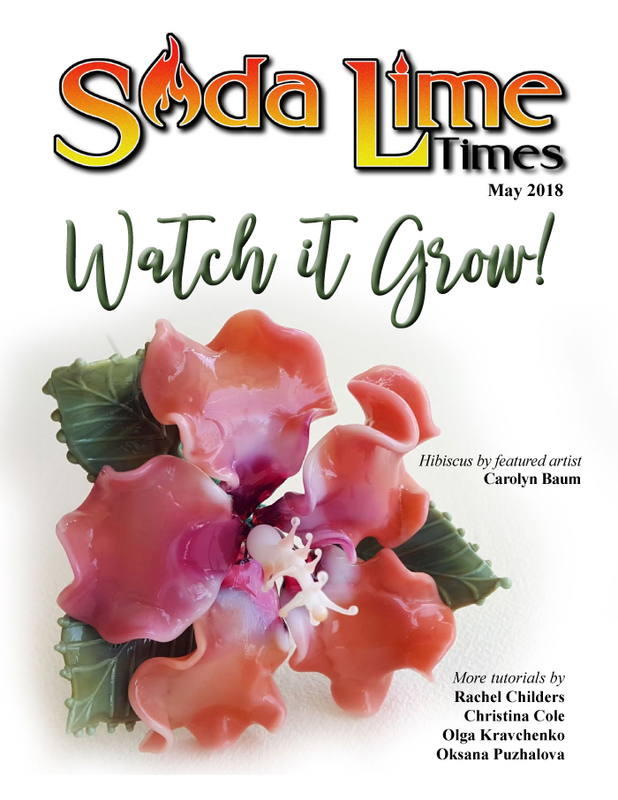 The May 2018 issue is Watch it Grow and is all about flowers, leaves, trees; anything that grows! Our featured artist is Carolyn Baum. 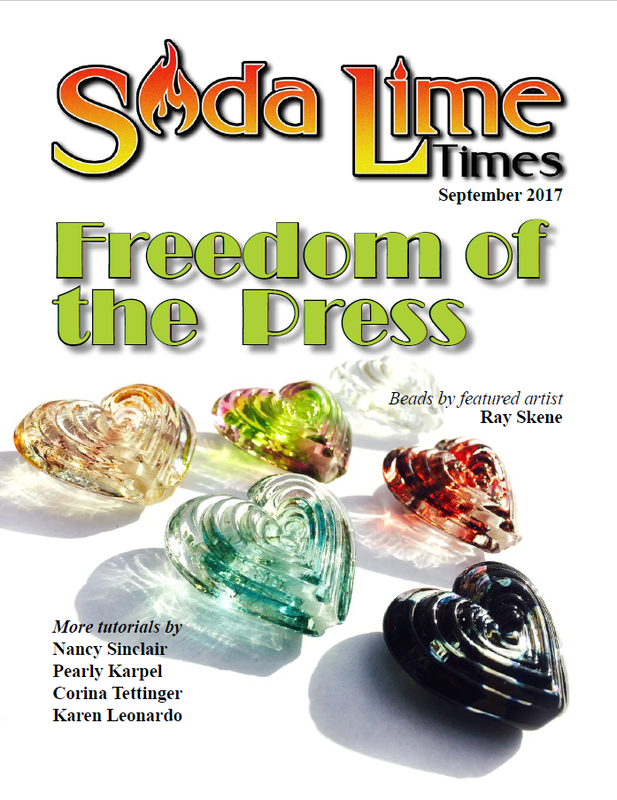 Articles include Rolling with the Changes - The International Society of Glass Beadmakers Moves Forward by Susan Richards - ISGB President, Carmen Miranda in Miniature Glass by Janice Peacock Tips, Techniques, and Questions by Darryle Jadaa, Getting Down to Business - Check, Check, and Check by Catherine Winter, and our monthly Spotlight – Mad Sigh-ence by Darryle Jadaa. 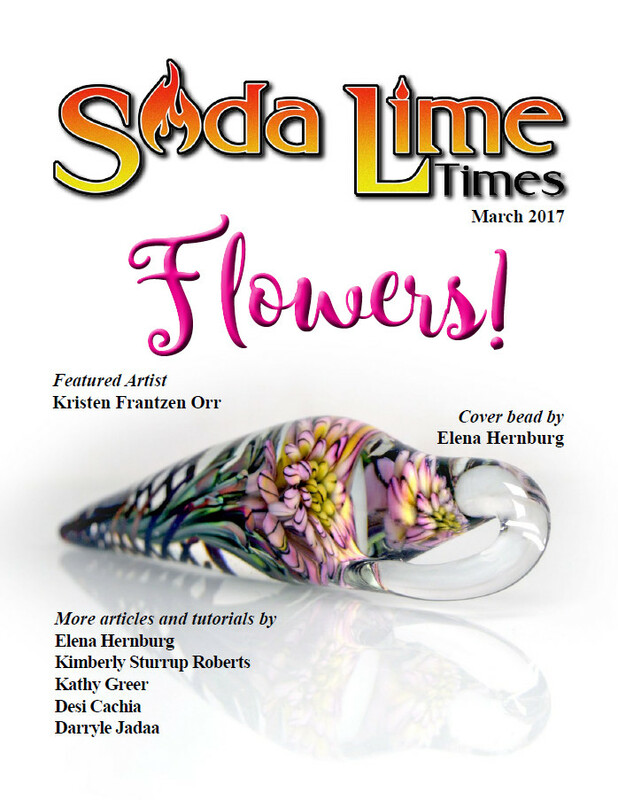 Tutorials include Floral Wedding Crown by Christina Cole, Hibiscus on a Wire by Carolyn Baum (on our cover), Everything’s Coming Up Roses by Rachel Childers, Lemon Necklace for Essential Oils by Oksana Puzhalova, and Watercolor Flowers by Olga Kravchenko. 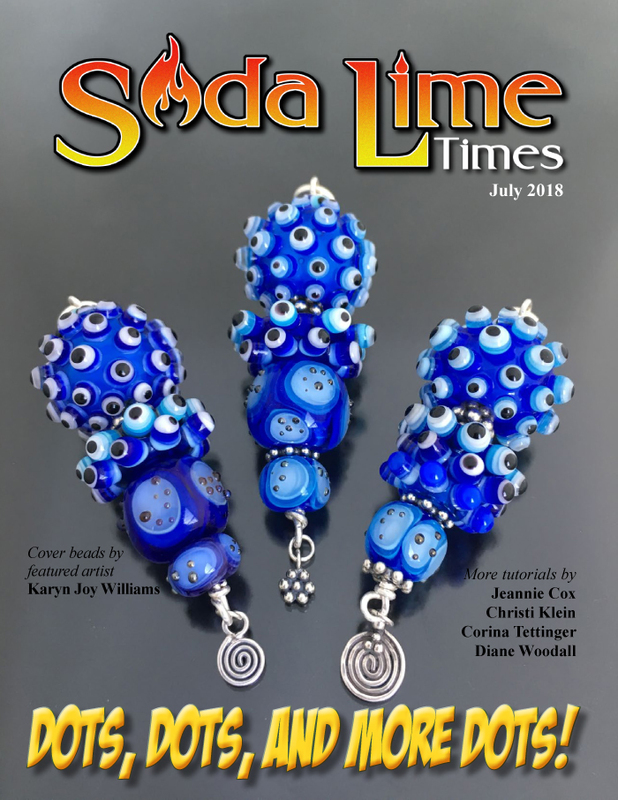 The June 2018 issue is all about cute, so if you like cute beads you will love this issue! Our featured artist is Marcy Lamberson. Articles include What Makes Cute Things Cute? by Darryle Jadaa, Gathering in Lauscha 2018 by Doris Stumpf, Tips, Techniques, and Questions! by Darryle Jadaa, and Getting Down to Business –The Genie in the Bottle by Catherine Winter. 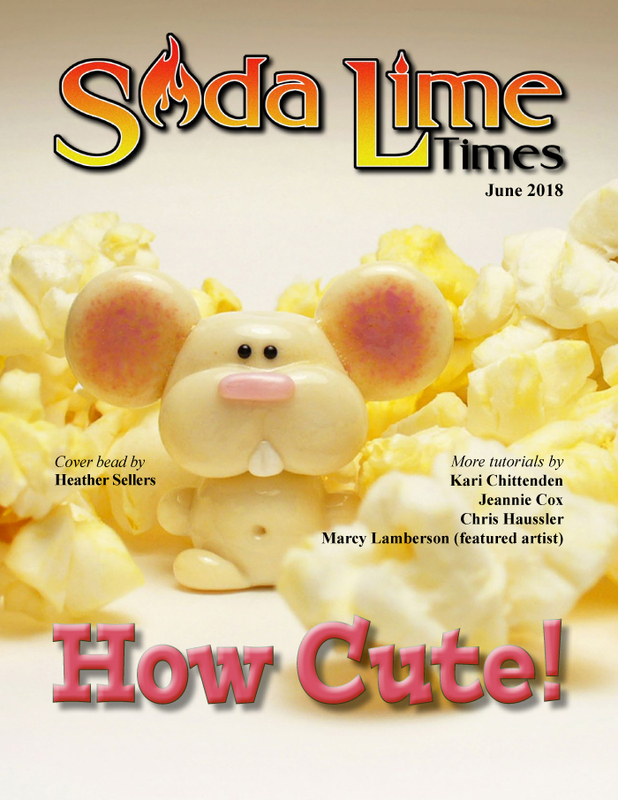 Tutorials include Seahorse Focal Bead by Marcy Lamberson,Big Smile Bunny by Kari Chittenden,Bumble Bees by Jeannie Cox,Not So Suddenly Sluggy by Chris Haussler, and Popcorn-Loving Mouse by Heather Sellers (on our cover. The July 2018 issue is all about dots, and the different ways to use them to decorate a bead. Our featured Artist is Karyn Williams. 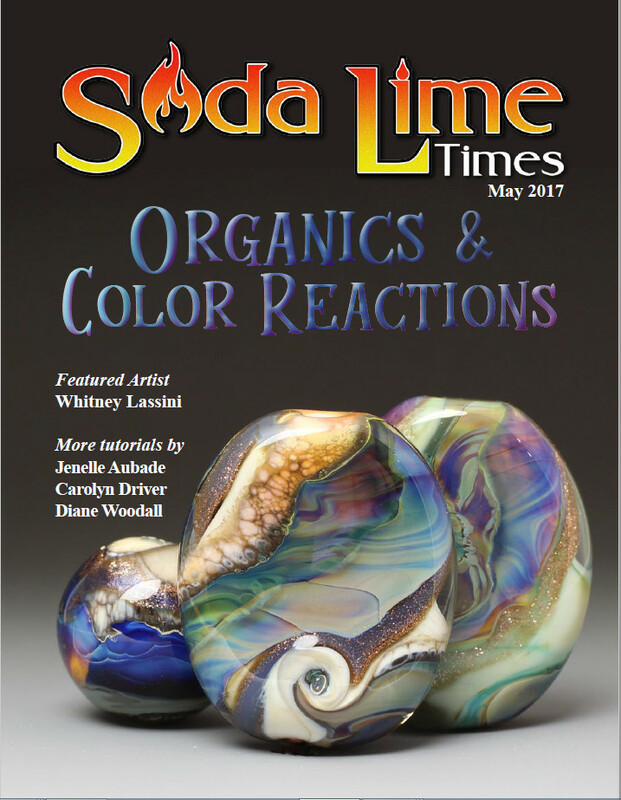 Articles include The Glass Art Society (GAS) Conference Review by Julie Delaney, Tuffnell Glass by Karen Leonardo, Tips, Techniques, and Questions! by Darryle Jadaa, Getting Down to Business – Psst - Here’s a Dirty Little Secret! by Catherine Winter, and our monthly Spotlight - Waste Not, Want Not! by Darryle Jadaa. Tutorials include Evil Eye Glass Totem by Karyn Williams, Pretty Bubble Pod by Christi Klein, Fish Scale Effect/Transitional Color Bead by Jeannie Cox, Creating Magic with Dots and Lines by Corina Tettinger, and Easy Raked Dot Bead by Diane Woodall. 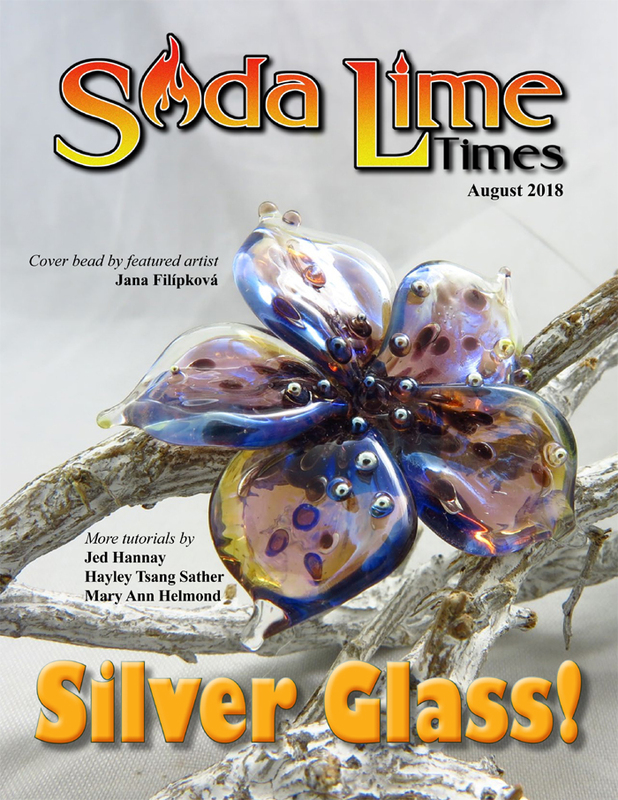 The August 2018 issue is all about silver glass, and the different ways to use it to make a bead. Our featured artist is Jana Filípková. 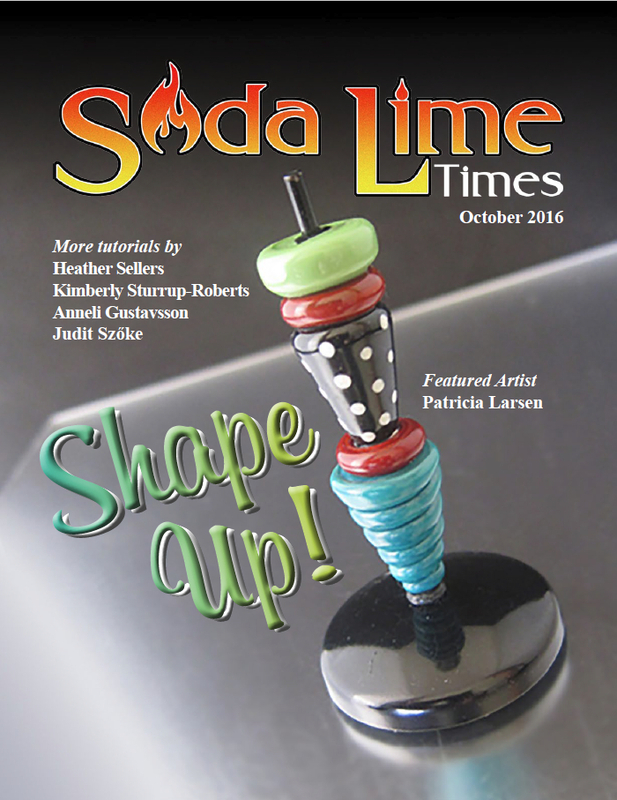 Articles include Carlo Donà Tools by Karen Leonardo, Pittsburgh Glass Center by Karen Leonardo, Getting Down to Business –Ten Ways to Move Forward When Business is Slow by Catherine Winter, Spotlight - Double Helix Glassworks by Darryle Jadaa, and Tips, Techniques, and Questions by Darryle Jadaa. 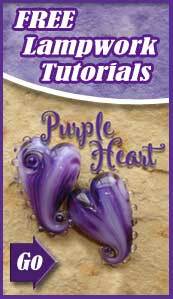 Tutorials include The Magic Flower by Jana Filípková, Hot Pink Beads with Rhea and Phoebe by Jed Hannay, Once Upon a Dragon by Mary Ann Helmond, and Silver Glass Gravity Swirl Bead by Hayley Tsang Sather. 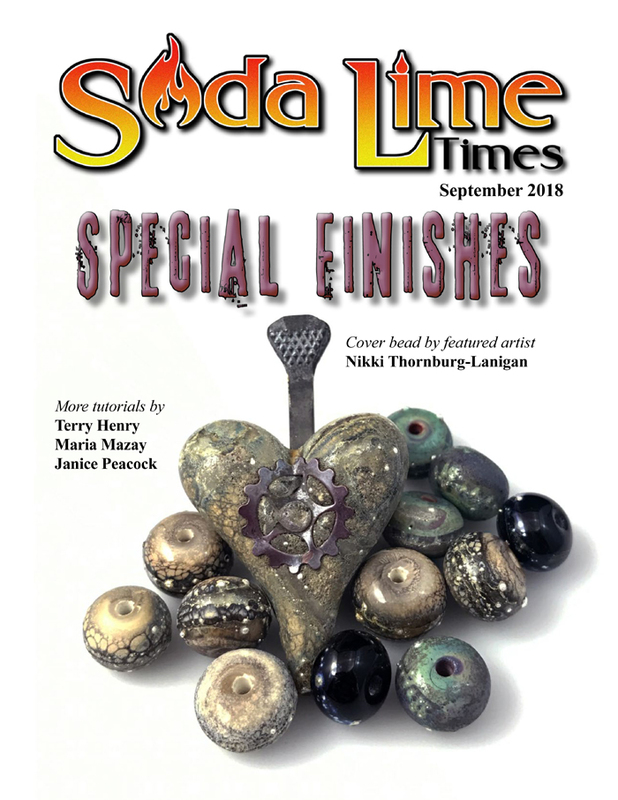 The September 2018 issue is all about special finishes, and the different techniques you can use to add special finishes to the exterior of your beads. Our featured artist is Nikki Thornburg-Lanigan. 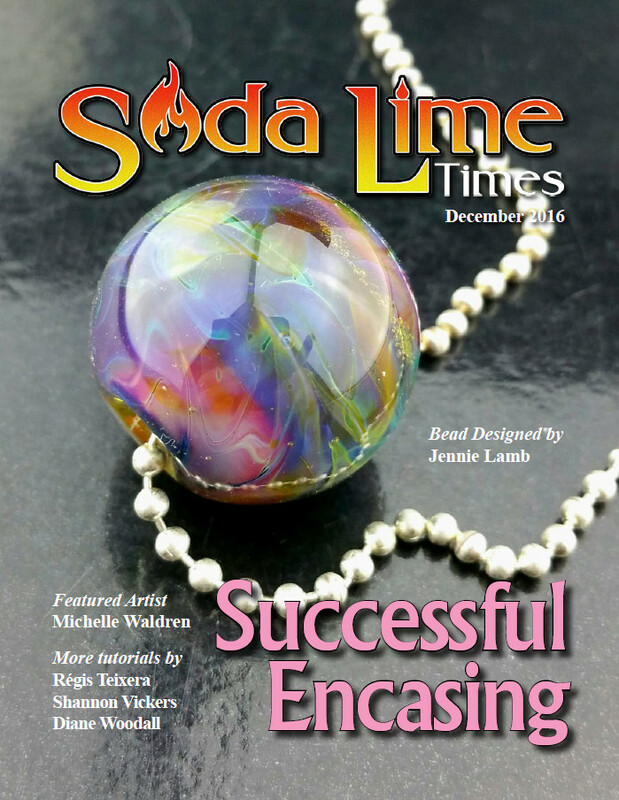 Articles inclue Nine Things Every Artist Should Know to Produce, Strong, Effective Advertising by Cynthia McEwen; Southeastern Michigan Glass Beadmakers Guild by Cindi Brunell; Tips, Techniques, and Questions by Darryle Jadaa; Getting Down to Business – Sales Going Up! by Catherine Winter; and Spotlight - Jelveh Designs Studio by Darryle Jadaa and Jelveh Jaferian. Tutorials include Nailed It! by Nikki Thornburg-Lanigan; Scroll Beads by Janice Peacock; Palladium Drop by Maria Mazay; and Electroformed Disc Earrings by Terry Henry. The October 2018 issue is all about the autumn season, both the colors of autumn/fall, and the holidays. Our featured artist is Yulia Ponomarenko. Articles include On The Flip Side - What Do Buyers Really Want? by Betony Maiden; Get Inspired - Seasonal and Autumn Theme Jewelry by Karen Leonardo; Getting Down to Business – Staying Connected by Catherine Winter; and Spotlight - Corning Museum of Glass by Darryle Jadaa. 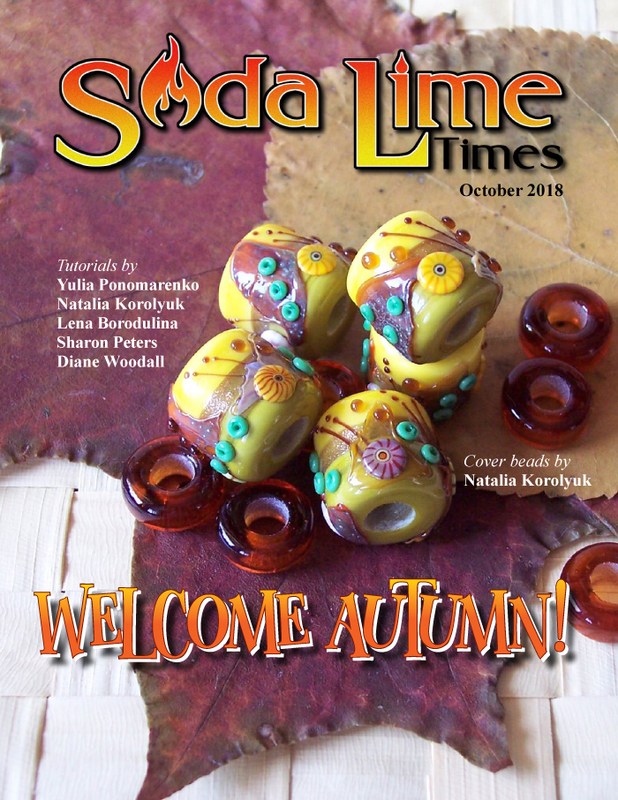 Tutorials include Smiling Skull by Yulia Ponomarenko; Autumn Leaf by Lena Borodulina; Autumn Jazz by Natalia Korolyuk; Ectoplasm & Friend by Sharon Peters; and I Can See You!- a Beads of Courage tutorial by Diane Woodall. The November 2018 issue is all about faces, both people and animals. Our featured artist is Irina Sergeeva. Articles include Finding Inspiration and Making Your Own Design by Hannah Rosner; "What’s in a Face?" by Karen Leonardo; Getting Down to Business – 10 Ways to Holiday Up Your Sales by Catherine Winter; and Spotlight - Heather Trimlett Tools by Darryle Jadaa. 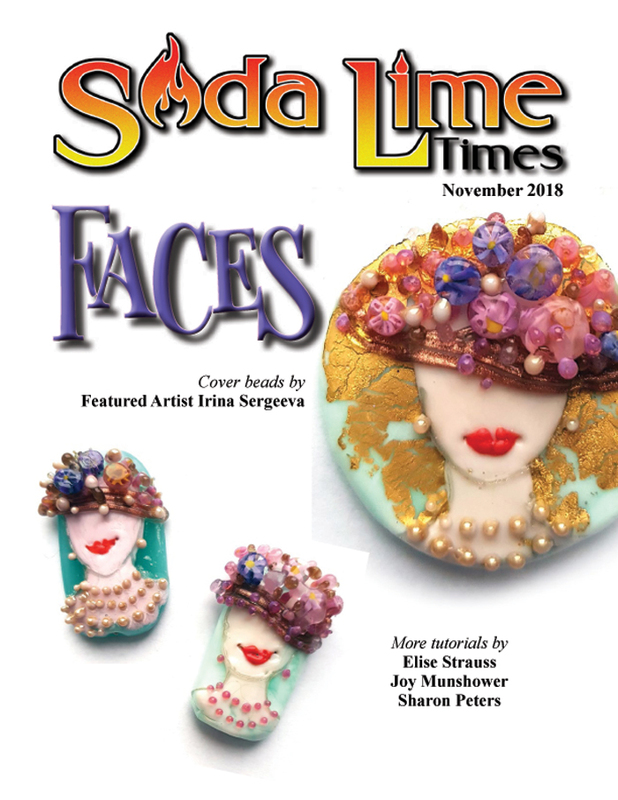 Tutorials include Lady in a Victorian Hat by Irina Sergeeva; Dog Head Sculptural Bead by Elise Strauss; Realistic Cat Face by Joy Munshower; and Gimme a Happy Face by Sharon Peters. 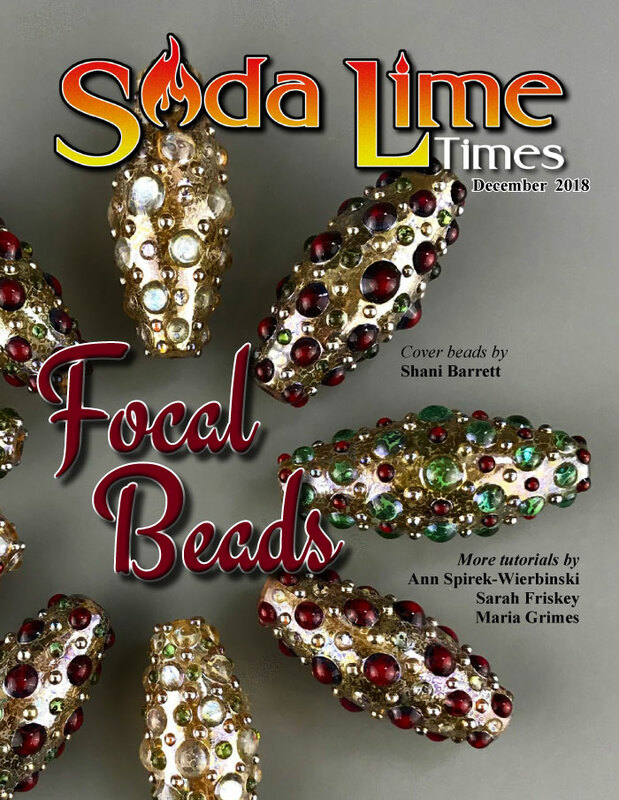 The December 2018 issue is all about focal beads, with three that are geared toward the Christmas holidays. Our featured artist is Ann Spirek-Wierbinski. 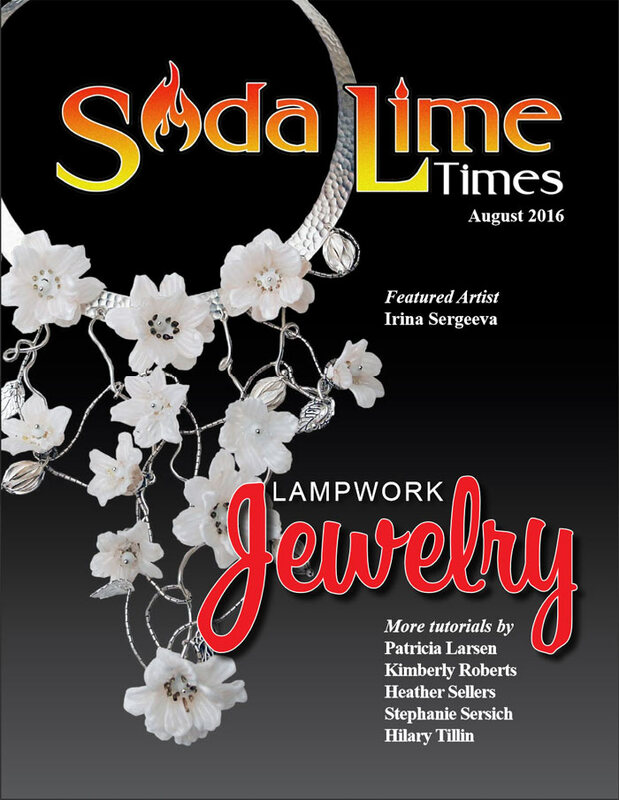 Articles include Moonlighting as a Lampwork Beadmaker by Susan Wehner and Jill Cage; To Tag or Not to Tag? That is the Question by Karen Leonardo; and Spotlight - Val Cox Studio by Darryle Jadaa. Tutorials include Christmas Poinsettia by Ann Spirek-Wierbinski; Golden Studded Holiday Focal by Shani Barrett; No Rain, No Rainbows by Sarah Friskey; and Glitter Kitty by Maria Grimes. 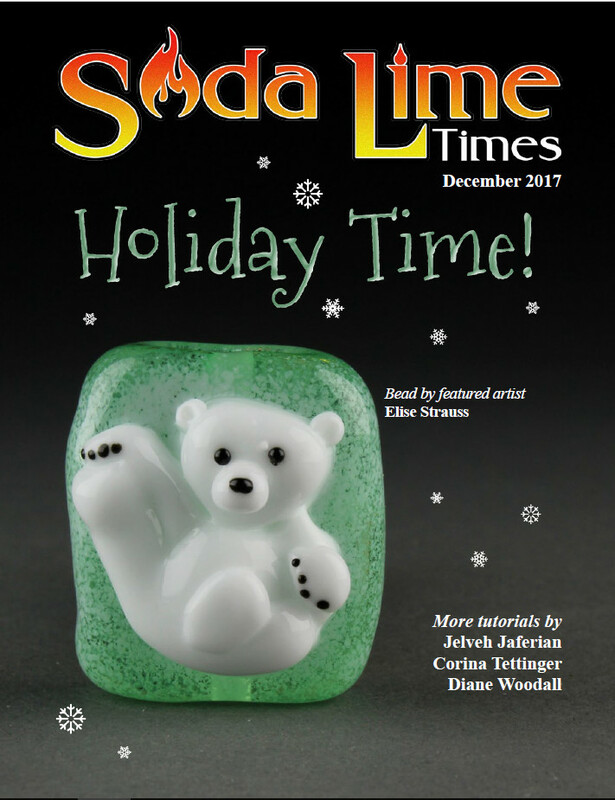 The January 2019 issue is called In Your Imagination, and it also features some articles and tutorials for Beads of Courage. Our featured artist is Maria Grimes. Articles include Beads of Courage – Providing Arts-in-Medicine Programs to Children Around the World By Becca Gladden; Beads of Courage Needs You! by Karen Leonardo; Artistic Journey - Technique vs Design by Deryn Mentock; Getting Down to Business - Five Ways to Bring a Customer Back by Catherine Winter; and Spotlight - Creation is Messy by Darryle Jadaa. 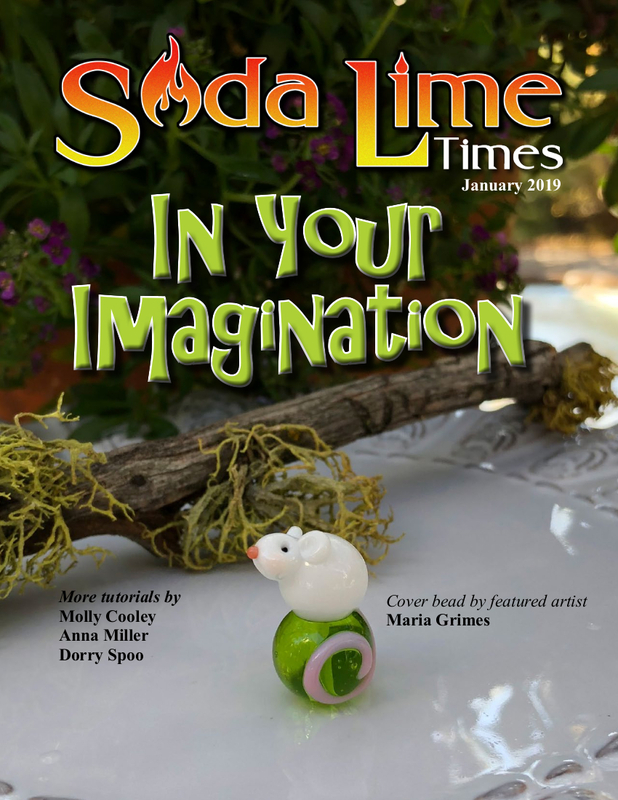 Tutorials include Marvin the Mouse by Maria Grimes; Fantasy Palm Tree by Molly Cooley; Alice in Wonderland by Anna Miller; and Two Lucky Charms - The Ladybug and the Hedgehog by Dorry Spoo. 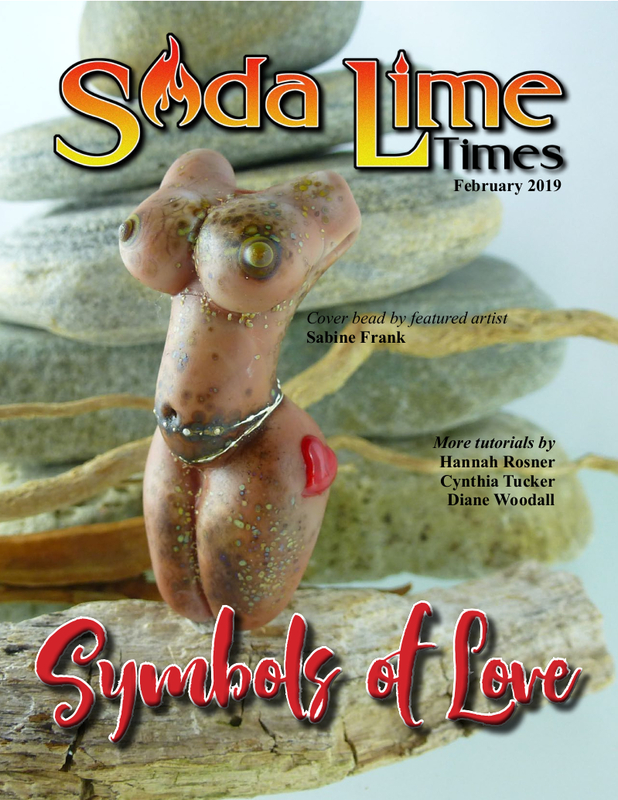 The February 2019 issue is called Symbols of Love. Our featured artist is Sabine Frank. 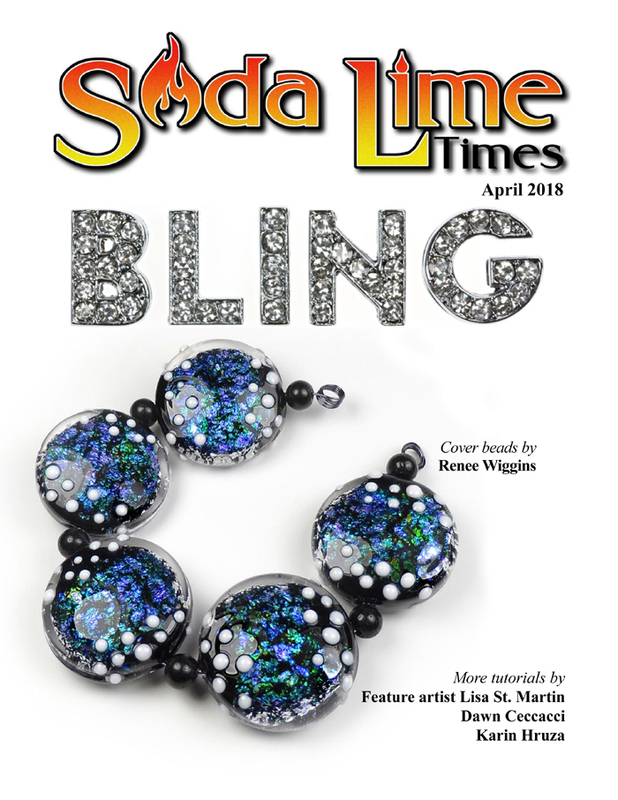 Articles include Memorial Beads - What You Need to Know Before You Start by Hannah Rosner; Art and Fear by Jane Harter; Getting Down to Business - Lose Weight Instantly! by Catherine Winter; and Tools of the Great Artists by Darryle Jadaa. 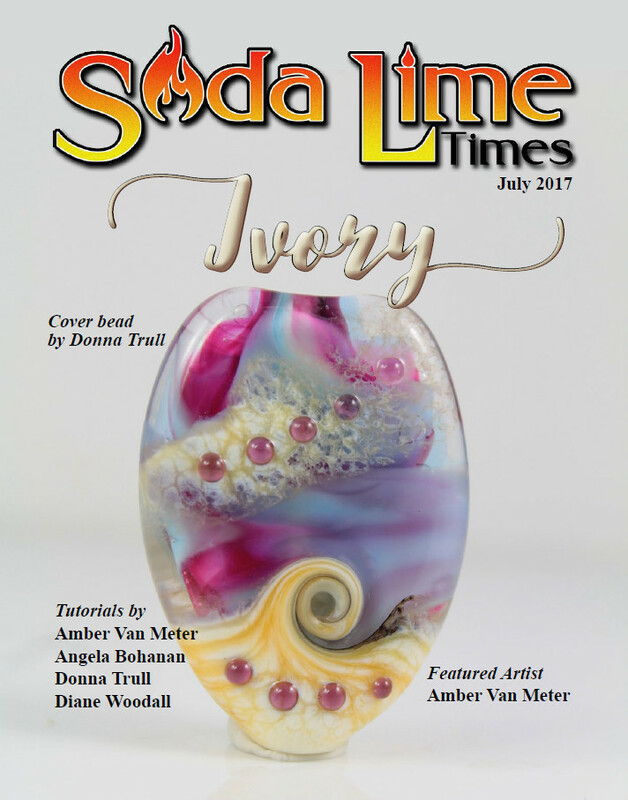 Tutorials include Lady Valentine by Sabine Frank; Memory Galaxy Bead by Hannah Rosner; Unlock My Heart - Seascape Heart On a Key by Cynthia Tucker; and Chocolate-Covered Cherry by Diane Woodall. 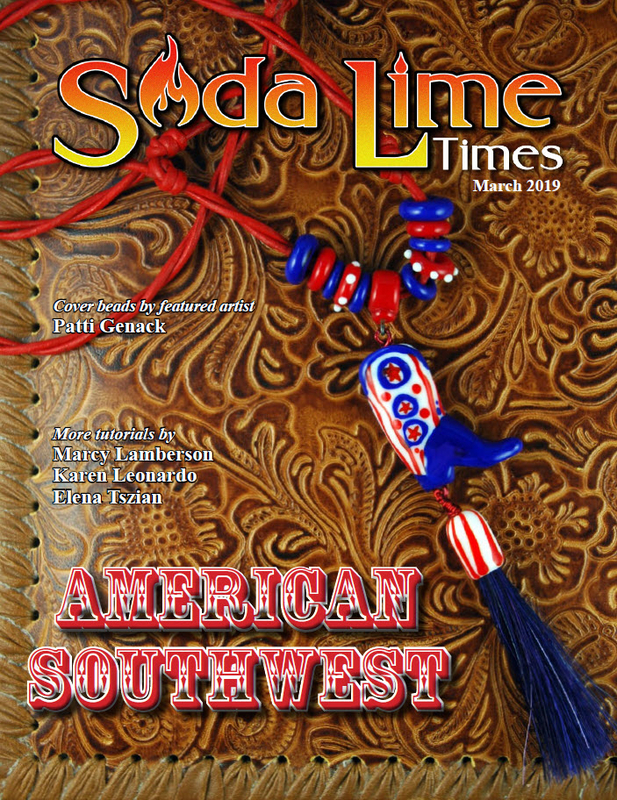 The March 2019 issue is called American Southwest. Our featured artist is Patti Gennack. 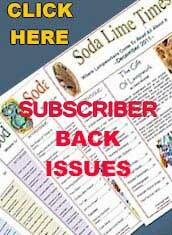 Articles include Free Shipping - Or Not! 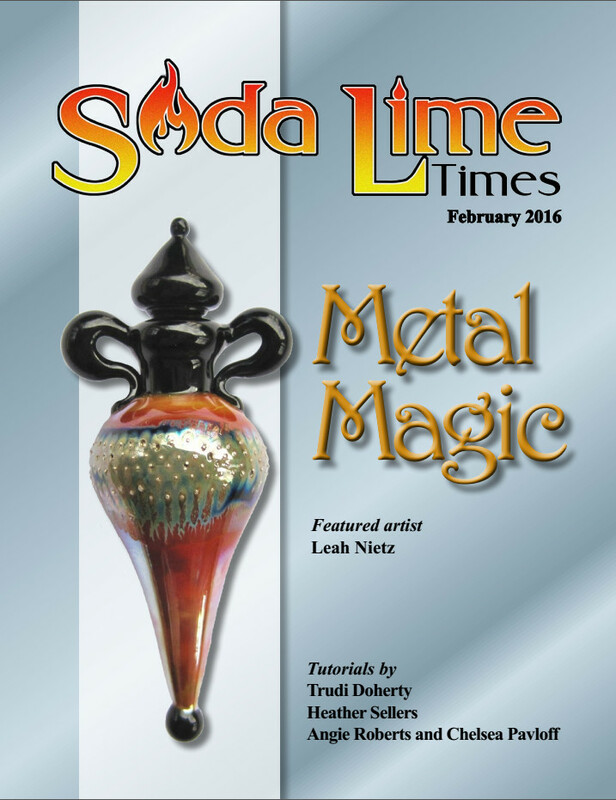 by Laurie Ament; Borax, the Old West, and Borosilicate Glass by Darryle Jadaa; and Spotlight – Glass Diversions by Darryle Jadaa. Tutorials include Cowgirl America (Cowgirl Boot) by Patti Gennack; Fabulous Feathers by Marcy Lamberson; Colorful Cacti To Decorate Your Home by Elena Tszian; and Easy Faux Stones by Karen Leonardo.